Preserving and restoring your log home investment. High Country Restoration are your Montana wood care experts. From new construction to heirloom properties, interior and exterior, our team is dedicated to preserving log and other wood sided homes — from inspections and minor touch-ups to complete log restoration. Montana’s log and wood sided home experts. 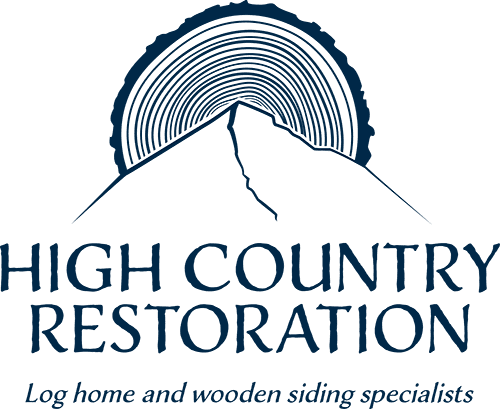 With over 12 years in the industry, High Country Restoration in Montana views every project as an opportunity to apply our knowledge and skill to restore your family’s home to its prime. We work closely with all of our clients to understand your needs and discuss what work is required, uncovering the most cost-effective approach for the best results. Our community is growing fast. With the building boom in Gallatin Valley, many contractors are aiming for speed rather than quality. High Country Restoration refuses to cut corners — from initial inspection to cleanup, our unparalleled and personalized service will always exceed exceptions. We are certified, preferred providers for industry leaders such as Sashco, Permachink, Weatherall. Our team continually invests in product education and training to improve our process, and maximize your results. From start to finish, Ryan and his men were professional in every sense of the word. Hard working, knowledgable, friendly, respectful of our home and surrounding gardens. Just an easy group to work with. We couldn’t be happier with the job they did and highly recommend them. Our home looks fabulous and the chinking of the logs has had a positive impact on our heating bill. Ryan and his entire High Country Restoration team were wonderful! He worked closely with us to solve a number of complex problems and to develop a suitable repair timeframe. The entire work team was not only highly skilled, but friendly and well mannered. There were no unanswered questions and Ryan made great suggestions. We could not be happier with how our home looks and we know it is structurally sound. We couldn't believe the transformation of our old log home in Vermont after High Country Restoration completed the job....our home turned from old to new like it was just built. The cabin was black with age. We hired HCR based upon your expertise and were thrilled with the results. The cabin looks like it was built last week not years ago.